Chiropractic Care | Peeks Chiropractic, P.C. 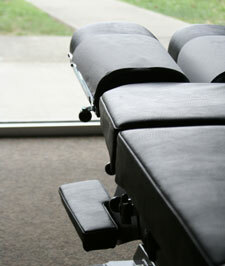 Did you know that 90% of people who go to the chiropractor have been to another type of doctor first? They are sincere folks who have pain or a condition they cannot or do not want to live with. So they go to people whom they feel will rid them of their malady. The medical model typically says …”This is what we are calling your symptom(s) and take this to get rid of the symptom(s).” The medical community’s total focus is on the presentation of the symptoms. Conversely, with the chiropractic model, a chiropractor listens to your description of your problem and then focuses on discovering how to restore your once-present, normal function. This is because the loss of normal function has produced your symptoms. This is where the “getting more than you asked” comes in. The best aspect about chiropractic care—other than it is all natural, is without drug side effects and isn’t invasive like surgery— is that while your symptoms are going away, your long-lost normal bodily functions are re-established. Think of a seesaw. On one side you have normal function of all of your bodily parts. On the other side is presenting symptoms. When the function side is up, the symptoms side is down. When the symptoms side is up, the function side is down. Chiropractic works by restoring the communication network between your brain and your body. This communication network is your spine and its complex distribution of nerves. The plan for the restoration of the communication network comes from the analysis of your spine, where your spinal cord is housed. Once the spine has unlocked, the nerves then once again carry all of the information to restore and maintain your body’s natural, normal functions. You get your life back! Symptoms are a sign that normal function has been lost. By restoring the function, the symptoms go away. It is getting more than you asked for since initially what you were asking for was just getting rid of the symptoms. With chiropractic, you are getting two for one: restoration of once lost or reduced functions, resulting in the reduction or removal of the symptoms that have been plaguing you. You just wanted your symptoms gone, and it never occurred to you that you could have your life regained and enhanced. Imagine being able to enjoy your favorite hobbies, exercise, sleep better and feel like doing things again for yourself and others. Chiropractic can allow you to do all that and more. Remember the seesaw? High function equals no symptoms! Value your body, your life, your future. Stay on the high side of the seesaw!